2018-09-19: Creators.Direct is shutting down! Please read the shutdown post for further information. Creators.Direct is a service to help content creators connect to their audience. It provides Android and iOS apps containing exclusively your content, which is synced automatically from all major content providers. The design of these apps can be extensively customised on demand, and everything is included within the monthly fee. Additionally, custom news items, events, links, and notifications can be created, as well as accepting earnings from your audience. These earnings can notify via email, StreamTip, or StreamLabs, to integrate with your existing workflow. Whether you make videos, write articles, take photos, make twitter jokes, record podcasts, discuss politics, or a combination of the above, Creators.Direct can help you connect with your audience. What is required from me to have my apps published? 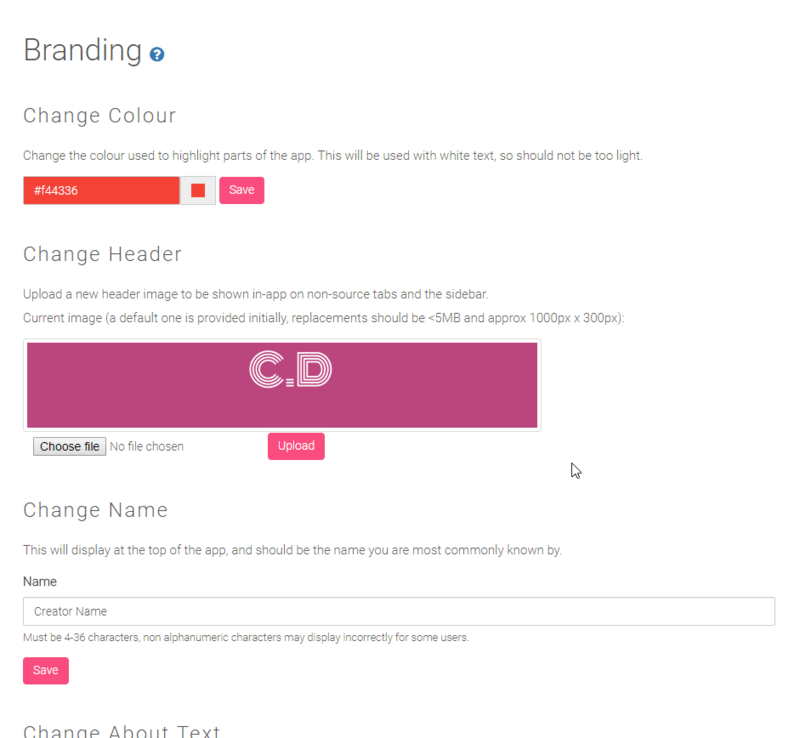 To summarise, all you need to do is add content sources and pick colours / text for your app. No programming knowledge required! How much does Creators.Direct cost? Signing up for an account is free, but having apps in the Play Store and iTunes requires a monthly fee. The exact cost varies depending on plan, payment cycle, and discounts. Please visit the checkout for an up to date price. Can I work for / with you? Whilst we're not currently hiring, we're always looking for new content sources to interact with. So long as you've got a reasonable API / rate limits, and have a userbase, we're probably interested! If you work with / for a company currently listed in the Unconnectable Sources help section, please get in touch! I've got an idea for Creators.Direct! Great! Get in touch with support and we'll look into it. Please note that only those on the Overload plan can commission new features. What happens if Creators.Direct shuts down? Firstly, Creators.Direct is unlikely to shut down entirely as the content syncing servers are mostly automated, so can continue syncing even if no new customers are being taken on. If for whatever reason Creators.Direct does shut down, we will give as much warning as possible (minimum 3 months), and refund any unused time, as well as providing a mechanism to export your app configuration. To sign up for a free account, please visit the Register page! Once an account has been registered, it cannot be used until the email address has been verified. This improves account security, and ensures that users can always be contacted if needed. To enter a verification code or resend the verification email please visit the Activation page! To make changes to your email, password, or other basic details, please visit the Account page! You can also configure different email addresses for account updates, earning notifications, and payment transactions. If you no longer wish to have a free Creators.Direct account, please send an account deletion request to support, and it will be actioned as soon as possible. If you instead wish to adjust your payment details or cancel your plan, please see the Billing section. Note that this process is not reversable. What devices can the Android app be installed on? Custom Creators.Direct apps will work on all Android phones and tablets above API version 17 (>95% of devices), regardless of language or mobile network. What devices can the iOS app be installed on? All modern iOS devices are supported, so long as they run iOS 9.2+ (98% of all devices). Both iPhones and iPads are supported, with the app primarily designed for iPhones. How can I manage my app's store listing? Whilst most aspects of your application can be managed via the Creators.Direct portal, information about the app itself can generally only be modified by logging in to the appropriate store management site. Links to these management sites are provided on the Creator Portal homepage (next to "App management" under "External Links"). What parts of my app's store listing can I manage? - Modify app icon, screenshots, and description. - View & respond to ratings and reviews. - Control distribution of the app. - Access Sales and Trends. - Preview new versions of the app on TestFlight before they are released. - Modify in-app purchases. Any changes will be overriden by changes made via the Creators.Direct portal. More information is available on user roles and role permissions. - View (and reply to) ratings and reviews. - Access app downloads and sales reports. - Preview beta versions of the app before they are released. More information is available on user permissions. What content rating will my apps have? All credit / debit cards are accepted, as well as bank transfers and PayPal. Note that all transactions go through PayPal. Why do I need to use PayPal? PayPal allows the use of credit cards, debit cards, and bank transfers. Using PayPal ensures that you can use your preferred payment method, whilst reducing the billing complexity for both parties. Additionally, using PayPal means you never need to enter your payment details directly on Creators.Direct, and instead can use PayPal's industry leading service for maximum protection. Finally, as all earnings payments are made via PayPal, having one point of monetary exchange makes record keeping for all parties much simpler. What do I do if I have a billing problem? The best place to start is by contacting support. If we cannot resolve your issue, we will refer you to the appropriate third party. Why was my service cancelled? 1. Payment failure: If the PayPal recurring payment could not be taken, your apps will be kept in the stores for a minimum 7 day "grace period", after which they will be removed. If you resolve your funding issue before the grace period ends, please contact support to request a billing reattempt. 2. Terms of service breach: We will generally only cancel service under extreme circumstances (for example hate speech, illegal activity, harassment of others), and will try to contact you to resolve the issues beforehand. We haven't had to cancel any contracts for this reason yet! Branding allows you to customise the look and feel of your apps, to ensure they fit the rest of your brand. All of the customisation is optional, but strongly recommended to keep your fans from feeling alienated. What branding options are available? - The overall accent colour of your app, shown in various places throughout the app. - Your default header image, shown in the sidebar and at the top of non-source tabs. - Source header images, every source can have a custom header image or use a default. - About text, an additional section of HTML / text that can be displayed to users. - App name, description and avatar are all completely under your control, so long as they meet the relevant app store's guidelines. What are the rules for branding? In general, avoid using illegal / copyrighted / offensive material, and avoid misleading others. Obviously many streamers have offensive language, and that's absolutely fine, it's generally more extreme racist / sexual "jokes" that will cause an issue. Apple's Review Guidelines and Google's Developer Policy Center have comprehensive lists of all restricted content. If Google / Apple's rules are broken, they are likely to remove your app from their store. If in any doubt, please ask support for assistance! What are the guidelines for branding? Colour: Your branding colour should be a strong, bold colour. Light colours risk making text harder to read. Headers: Headers should be approximately 1000px wide and 300px high. Additionally, they should be in an uncompressed format (PNG recommended), and 5MB or less. Store Listings: Store listings need to follow all guidelines of that store, and should also be as descriptive as possible, at the bare minimum mentioning your name. Can I change my branding once my apps are published? Yes! You can change them whenever you like, and the apps will update automatically within a few hours. How can I customise my App Store / Play Store page / listing? Once you have been invited into the beta for your apps, the management links on the Overview tab of the Creator Portal will let you change these from the defaults. Earnings are a way of receiving contributions from fans, as an alternative to the more traditional routes of monetisation (e.g. adverts). Those on a qualifying plan (all except Basic) can configure earnings tiers that fans can choose between. These earnings can be hooked up to either email, StreamTip, or StreamLabs integrations to receive alerts in real time. However, mobile earnings have advantages and disadvantage to be considered when compared to traditional earnings. Please see the other Earnings FAQs for more info. What fees do earnings incur? There are 2 fees when receiving earnings. The first is the payment handler (getting the earnings from the fan -> Creators.Direct), the second is our fee (getting the earnings from Creators.Direct -> you). These fees will be broken down below. Apple or Google (depending on platform) take 30% of every transaction. This is to cover all the identity management, chargeback insurance, currency conversion, bank fees, and other services provided in order to verify and receive the contribution. There is unfortunately no way to reduce / avoid this fee. In addition, Creators.Direct charges 7% of the total to cover the fees, paperwork, and configuration required to transfer between our accounts and your Paypal. Earnings also undergo additional security checks, above what the platforms themselves offer. PayPal charges approximately 3.6% + a fixed fee on every transaction, which is included in this fee. The 7% figure is exactly 10% of the post-payment processor amount, to make accounting easier. In summary, you will receive 63% of every paid amount, the vast majority of the fee being to payment processors. However, there are a lot of advantages which may offset this fee in your case, continue reading for more information! What are the advantages of earnings? Earnings themselves are an excellent way of receiving additional income whilst creating your content. They are heavily utilised by streamers, and allow fans to contribute more privileged messages than a normal chat. A common motivation to give money is the streamer reading out their name and message, or suggesting an action to take in a game. Mobile earnings are a relatively untapped source of potential revenue, meaning they will generally be in addition to existing earnings, not replace them. For example, many users have unused iTunes and Google Play credit which cannot be given to a content creator in any way besides a system like Creators.Direct. In addition, receiving earnings via your app will encourage users to use it more often, and stay more engaged. They will also be able to receive contributor-only notifications from yourself, which may convert fans into contributors. Additionally, having earnings in the same app as all of your content provides a more connected experience for your fans. For example, you may make an announcement that the names of all contributors in the next 7 days will be used in an upcoming video. With Creators.Direct, they can seamlessly read the announcement then make a contribution. Finally, chargebacks aren't as common via mobile methods, as users are less willing to risk any consequent negative action on their Google or Apple accounts. As such, you can be more confident that a received payment is genuine. What are the disadvantages of earnings? The primary disadvantage of mobile payments is the fees associated with them, as described above. For more information on these please see the relevant FAQ. In addition, users are a lot more likely to attempt "fake" payments. Due to this, Creators.Direct enforces additional security on top of the usual Apple / Google safety checks, by communicating with a central server before accepting a message. You will not receive an alert (and it will not be included in any summaries) until it has passed additional verification. Finally, you will not receive your earnings immediately (but it should still be faster than existing Paypal-centred solutions). Please see the following FAQ for more information on payment schedules. Both stores tend to make payments to Creators.Direct around the middle of the month after a contribution is made, so long as a relatively low threshold is reached (e.g. $10 for Apple). Once the payment has been received, it has to be processed by ourselves, which usually takes a couple of days, but can be same-day. How will I receive my earnings? You will receive your payments via Paypal, to your currently configured Paypal address. If this email is incorrect, it can be changed in your account settings. If a payment is made to an incorrect address, please contact as soon as possible so that it can be resent. As noted previously, earnings will usually be paid around the 18th of the month after the contribution was made. How will I be notified of earnings? By default, an email notification will be sent to your registered email address immediately after it has been verified. In addition, you can configure a Streamlabs account to receive live notifications, just like with normal contributions. Earning messages will includes the contributor name and message, as well as the amount. In addition, you will be emailed a payment summary shortly after your earnings have been paid to your Paypal account. Why are earnings not called donations? The word "donation" (to the app stores) implies a charity, and an app can be removed if it uses this wording without being a registered charity. As such, terms such as "earnings" and "contributions" are used instead. You're welcome to continue calling them donations in your own streams / posts, but doing it inside the apps (with links, news events, and posts) is not recommended. Events are a way to display upcoming occasions. Events can be one-off or repeating, with an optional location. These can be used to list a streaming schedule, upcoming events, a video agenda, your schedule during a convention, or anything else! 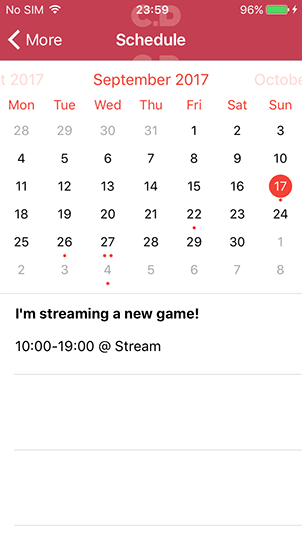 Having them all inside the app means fans can easily see an overview of all events on the calendar, and also receive notifications when new events are added. Events work by utilising a shared Google Calendar. This calendar is owned by the content creator, and any changes (additions, modifications, deletions) made are synced to users of the app. Using Google Calendar allows utilising the advanced scheduling capabilities, such as setting up recurring events at unusual intervals. How do I configure an event calendar? Fill in the calendar details, taking extra care that the timezone is correct. The calendar details will not be seen by your fans, only the events. Click "Create Calendar" to save the settings. Set a name for the event, whether it is all day or at a specific time. and optionally enter a location. Press "Save", and the new event will be synced within the next few minutes, and users will be notified if they have opted in to notifications. Events are displayed on a calendar within the app, with events appearing on the day they occur along with times, locations, and title. For example, here is an event displayed on the iOS app. Links are a way of guiding your fans to additional websites besides content sources. For example, you may want to link to a merchandise store, other related content creators, or a sponsor's website. These links must follow the rules set out by the individual app stores, summarised below. What are the rules for links? Most importantly, links must not link to any contribution sites. This isn't a Creators.Direct rule, it's by the app stores to prevent bypassing their fees. Apps are removed very swiftly for breaking this rule, be careful! Linking to an online store selling physical merchandise (and optionally digital merchandise) is allowed, but not one that exclusively sells digital merchandise. Again, this is an app store rule. Sites like Kickstarter are also permitted. Additionally, the usual "no racist, highly offensive, misleading" etc rules apply. These are always changing, so please refer to the guides themselves before adding a link. How many links can I have? This varies according to your current plan, with quantities ranging between 0 and unlimited! For details, please see the checkout. The first few (usually 4-5, depends on screen size) links are displayed in the sidebar. Any more are contained in a "more links" menu on Android. All are displayed at once on iOS in a scrollable list. A network is a way of managing multiple creators from a single account. For example, an individual may have a gaming persona YouTube / Twitter / Facebook, as well as a professional blog / Facebook. Having multiple apps helps separate the different audiences, and managing both from a network account simplifies matters. Another common use case is an existing network / MCN on YouTube / Twitch / Dailymotion. If this existing network creates a Creators.Direct network, they can manage all of their member's apps easily. Who can start a network? Anyone, so long as they have 2 or more creator accounts to add! How do I start a network? As creating a network requires confirmation from various parties as well as payment detail changes, please email contact@creators.direct for further information. How much does a network cost? Creating a network is free, but all network member's plans must be paid for. An additional discount of approximately 10% is usually given when purchasing plans as a network, but additional discounts are also given to creators in certain markets. For a free exact quote, please email contact@creators.direct. What features do networks provide creators? Being part of a network means all plan payments (and optionally earnings) are handled by your network manager, removing complexity. In addition, your network manager can handle news, events, sources, branding, and links. As a creator, how do I join a network or check network settings? All requests must go through your network manager, who will have direct contact with a Creators.Direct representative. Once they have applied on your behalf, a confirmation email will be sent to the primary email address on your Creators.Direct account. As a network manager, how do I add creators? Email the same Creators.Direct representative who initially configured your network with the creator's name. Once the creator has agreed to join your network, you will be notified. What options do network managers have? - Change the name of their network. - Override the PayPal address that member's payments are sent to. - Choose whether members can view their app and fan statistics on their Overview. - Choose whether members can view their earnings. - Choose whether members can approve their apps for release, or whether a network manager has to do it. - In addition, network managers can edit the branding, sources, links, news, payments, and events of all creator members. Can I be a creator and a network manager? Unfortunately not on the same account! Making a new account to become a network manager is free however, as no plan is required. News items are a way to make announcements in a more permanent way than a one-off notification. What can be in a news item? Whatever you want, so long as it follows the content guidelines! A common usage is announcing a new line of merchandise, a new collaboration with another creator, or other large announcements. They can contain basic HTML, but writing extremely long posts, or embedding lots of images / videos will lead to a performance hit. How are news items displayed? On Android, the 6 most recent news items are displayed on the sidebar within the app, and users will also receive a notification when a new news item is added. On iOS, the news item titles are displayed, and tapping them will open a way to view the entire news item. This is an example of a news item in the Android app. What can I do with notifications? Fans already receive notifications for new content, events, and news items, however you may wish to make an additional notification prompting the user to visit a link, or another action. It's important to note that direct notifications are the only notification type users cannot opt out of, so excessive use of them will result in users blocking all notifications, or even uninstalling the app entirely. Notifications can be sent to all Android users, all iOS users, or both. Additionally, they can be sent to all users, donators, or non-donators. This can be used to provide exclusive content to donators. However, as there is no user registration, it's important to note that donator status will be lost if the user uninstalls the app. Notifications will open your Creators.Direct app by default, but they can also be configured to directly open a link. How can I send notifications? Notifications can be sent via the notifications page. Note that direct notifications are only available on the Overload plan, where they have no usage restrictions. Some content sources unfortunately cannot currently be fully integrated with. The most requested ones are listed below, along with an explanation, and any potential workarounds. Github (for project commits): For project updates, the RSS feed [project URL]/commits/[branch].atom is available. Github (for user commits): For user activity, the RSS feed [profile URL].atom is available. Imgur (for uploads): Only a paid API is available, and there is currently not enough demand. Imgur also removed their RSS features, so no integration is currently available. iTunes (for podcasts): There is no API available, however an RSS feed is available and can be automatically retrieved using a third-party site GetRSSFeed.com. Medium: For posts, the RSS feed https://medium.com/feed/@[username] is available. Quora: There is no API, or RSS feeds available. Various third party tools claim to create one, the most notable of those being IFTTT. SoundCloud: Currently new integrations are not being accepted, however an RSS feed is available and can be automatically retrieved using a third-party site GetRSSFeed.com. Wordpress: As Wordpress is a blogging platform, it has excellent RSS capabilities. A site's RSS feed can be accessed at [site]/feed/ or [site]/?feed=rss2. Patreon: There is no API available for published posts. LinkedIn: There is no API available for published posts. How can I test sources? Sources can be tested on the source preview page. 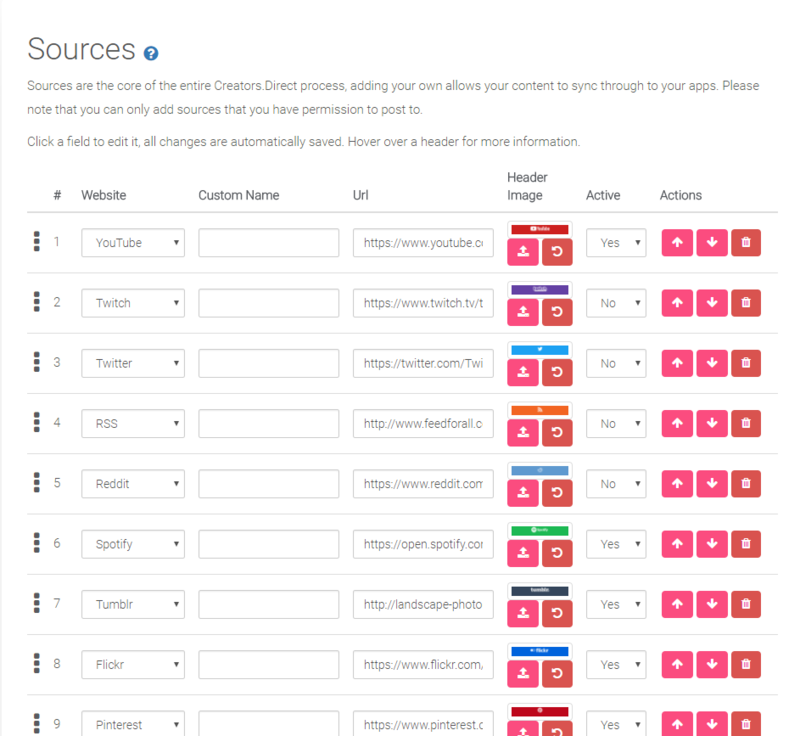 Add content sources (Twitter, YouTube, etc) to provide content for your app. This is done on the Sources page (preview) of the Creator Portal, from any of the fully integrated content sources. Most sources only require your profile's URL, but some with extra authentication (e.g. Instagram) will require you to provide Creators.Direct access to your content. Choose your colours, text, banner images (+ more!) to personalise your app's appearance. This is done on the Branding page (preview) of the Creator Portal. More information on this process is available in the Branding section of the help. Different price plans have different capabilities, pick one that meets your requirements. Capabilities can be compared in the Pricing section. For more information on billing, please visit the Billing help section. Once the previous steps are completed, your apps will be prepared for testing. Once the apps have been created, you will be invited to a private beta to ensure they meet all expectations, and make any last minute changes. After your testing has completed and you have approved the apps, they will be published to live, and your fans will be able to begin using them. For more information about Testing, please visit the Testing help section. Please ensure the email address configured as your Creators.Direct Google email is used throughout the process, otherwise certain steps may not work as expected. 1. Once you have completed the necessary steps to get your app created, you will receive an email from Creators.Direct containing a link to your Android app's beta. 2. Click the link, login to your Google account, then join the beta. 3. Visit your app's store page (link available in Overview tab of Creator Portal), and install the beta to your device. Please ensure the email address configured as your Creators.Direct Apple email is used throughout the process, otherwise certain steps may not work as expected. As well as the ability to test your app, you will also be able to customise your app's screenshots, store icon, store description etc using the links on the Overview tab of the Creator Portal. 1. Once you have completed the necessary steps to get your app created, you will receive an email from iTunes Connect inviting you to join your app's beta. 2. Click the link within the email, and log in with your Apple / iTunes account. 3. On your device, ensure you are logged into iTunes using the same email that joined iTunes Connect. 4. Install the Apple TestFlight app from the App Store. 5. Within the TestFlight app, you should see your beta app ready for installation and testing. To customise your app's title, description, screenshots, etc, use the App Management links on the Overview tab of the Creator Portal. This will only be possible if you have already followed the steps to join your app's beta. To make changes to your sources, news, events, links, and content, use the Creator Portal and changes will sync automatically. A startup connecting content creators with their fans, no matter the content.